Apcotex is one of the leading producers of Synthetic Rubber (NBR & HSR) and Synthetic Latex (Nitrile, VP latex, XSB & Acrylic latex) in India. The company has one of the broadest ranges of Emulsion Polymers available in the market today. The various grades of Synthetic Rubber find application in products such as Automotive Components, Hoses, Gaskets, Rice De-husking Rollers, Printing and Industrial Rollers, Friction Materials, Belting and Footwear. Range of Latexes produced by company, are used for Paper/Paper Board Coating, Carpet Backing, Tyre Cord Dipping, Construction etc. Apcotex has significant global presence and for last few years has done business in all continents and several countries. Company's Latex segment capacity is about 55000 MT and High Styrene Rubber (HSR) capacity is about 7000 MT. Both of these products are made in Taloja. On an average, the utilization level of these capacities is 70% - 80%. Company has 16000 MT capacity for Nitrile rubber at Valiabut it utilizes the capacity at Valia in different manner at different times depending on the product mix. At times, specialty products are produced that are very low in productivity but high in margin. Then, Capacity may vary anywhere between 12000 and 16000 MT. Company has witnessed strong export orders in Q1 FY2018. The company has reported falling margins in Q1 FY2018 as the company had some high cost raw materials inventory while the raw materials have fallen in this quarter. The company turns over its inventory in less than a month. Company purchases raw materials on month-on-month basis and passes on the changes to the customers, sometimes with lag effect. Raw materials' prices started crashing from March onwards till July, and company has procured some amount of higher cost raw materials in March and April and costs further kept came down. Price fall in the raw material prices continued for 4-5 months and it fell by significant margin of ~30%-40% month on month basis which is very rare occurrence in this business and thus this price fall has been taken as an anomaly. The price of key raw material Butadiene is INR 76 to INR 80 per kg in July, down from INR 200 per kg in March. Thus, company was forced to reduce their prices despite being stuck with the higher cost material. This has caused pressure on the margins along with the fact that Talojaplant was on strike till March so many customers could not be supplied products. Company's net cash position is INR 50 crores. One of the largest customer's volume and collections still remain uncertain. Company is catering to ~20% of the NBR market and estimates its market share to be around 17% to 18% atcurrent production levels. Company has initiated the first phase of capex amounting to ~Rs.30 Crores to reduce the operating cost and improve the quality atValia plant. Under this phase 1, Debottlenecking at Valia plant is being done, but this would not be adding any capacity.Company expects most of these projects under phase 1 to be completed by March 2018, but main project constituting about 70% of the total capex plan, will be completed by Q3 of FY2018. Phase 2 would be another capex of ~INR 30 crores for capacity expansion of 5000 MT, from 16000 MT to 21000 MT.This capacity expansion of 5000 MT at Valia is for Nitrile rubber only. Projects in this phase would start in next fiscal year and Company has target to complete those projects in the next fiscal only i.e. FY 2019. NBR per MT realization is close to INR 170000 per ton. With the expansion of 5000 MT and depending upon the then price realization, Company expects an increase of INR 60-70 crore in topline. Phase 3 would be bigger project to double capacity of NBR and company is still in planning stage and no exact timelines and finer details have been finalized yet.However, it would be a brown field project at Taloja or Valia. As of now, the total capex stands at INR 60 crores for phase 1 & 2 distributed over this fiscal & next fiscal year i.e. FY 2018 & FY 2019. Company would be financing these projects with internal accruals. The company is expecting strong demand in the rest of the year and has stated GST to be a big positive for the company. Company is targeting ~ INR 600 crores in FY 2018. It is considering the uncertainty of volumes and collections from one of the major customers of the company. Company expects that the operating cost would reduce and margins will improve from around January 2019 as the major project under PhaseI is expected to be over by then. 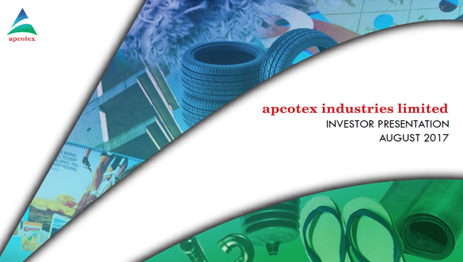 Apcotex caters to different industries and each has different market growth rate. Company expects to post double digit growth rates around 14%-15% revenue growth in a period of three years.